empowering and collaborating with partners through data sharing and education. OIG's actions in these areas advance prevention, detection, and enforcement of fraud, waste, and abuse in HHS programs that intersect with the opioid epidemic and help ensure quality care and treatment for those in need of services. Many HHS programs are involved with various aspects of the opioid epidemic, giving OIG opportunities to identify program improvements. Medicare, Medicaid and the Indian Health Service have influence over program integrity in prescription drug coverage; the Food and Drug Administration oversees new drug approvals and safety of existing drugs; and agencies such as the National Institutes of Health, Substance Abuse and Mental Health Services, and the Centers for Disease Control and Prevention award grants for education and treatment programs. Identifying opportunities to improve the effectiveness of HHS programs helps prevent waste, fraud, and abuse. To help detect fraud, OIG deploys state-of-the-art data analytics and algorithms to identify the most egregious providers for further scrutiny or investigation by OIG and its partners. In addition to leveraging data to detect fraud, OIG utilizes all advanced investigative techniques in its criminal, civil and administrative cases. To enforce laws, OIG may investigate cases on its own, or collaborate with its law enforcement partners. In the 2018 National Health Care Fraud Takedown, OIG and its law enforcement partners worked together to charge 601 defendants for opioids-related fraud related to prescribing patterns and to patient treatment. OIG has the authority to exclude individuals and entities from participating in Federal health care programs if they are convicted of certain criminal offenses, including felony convictions related to controlled substance for individuals connected to the healthcare industry. 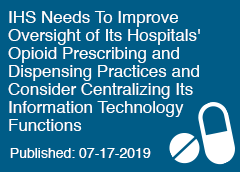 In addition, OIG has discretion to exclude individuals and entities on a number of grounds, including misdemeanor convictions relating to controlled substances for individuals connected to the healthcare industry. In the 2018 National Health Care Fraud Takedown, OIG issued exclusion notices to 587 individuals based on their conduct related to opioid diversion and abuse. OIG excluded Kentucky pharmacist, Lonnie Hubbard for 50 years as a result of his conviction of 71 counts, including 56 drug counts involving the illegal dispensing of controlled substances without a legitimate medical purpose and dispensing pseudoephedrine knowing it would be used to manufacture methamphetamine. From 2010 until 2015, Hubbard, who owned RX Discount Pharmacy in Berea, KY sold prescription pain pills without a legitimate medical purpose, and sold pseudoephedrine knowing or having reason to believe that it was being used to manufacture methamphetamine. Many of the people Hubbard sold to were addicts and drug traffickers in central and eastern Kentucky. OIG excluded Dr. Xiulu Ruan and Dr John Couch for 50 years because of their convictions for running a massive pill mill in Mobile, AL. Of particular importance in the trial were two brand name instant-release fentanyl drugs - Subsys and Abstral. Subsys and Abstral are only FDA-indicated for breakthrough cancer pain in opioid-tolerant adult patients. However, evidence showed that Dr. Ruan and Dr. Couch almost exclusively prescribed these drugs off-label for neck, back, and joint pain. Dr. Ruan and Dr. Couch received illegal kickbacks from drug manufacturer Insys Therapeutics in exchange for prescribing massive quantities of these drugs. OIG excluded Dr Adam Duer indefinitely because he voluntarily surrendered his license to the State of California while under investigation for unprofessional conduct and gross negligence related to his prescribing practices of controlled substances. The State's formal complaint alleged Dr Duer prescribed "clearly excessive amounts of controlled substances" for medical and non-medical purposes such drugs as hydrocodone, oxycodone, Serequel, alprazolam, Soma, and Cymbalta. OIG recognizes that its data analytics capabilities and on-the-ground intelligence about fraud schemes and health care system vulnerabilities can support the efforts of other stakeholders in the fight against the opioid epidemic and its consequences. OIG shares databases, statistics, risk score models, and methodology with other law enforcement partners, state entities, the Centers for Medicare and Medicaid Services, fraud organizations, and the Healthcare Fraud Public Private Partnership (HFPP). 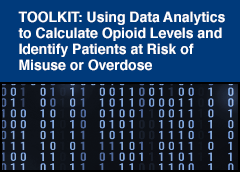 Recently, OIG released an analysis toolkit to assist its public and private sector partners with analyzing their own prescription drug claims data and to help combat the opioid crisis. Through conference presentations, webinars, brochures, and podcasts, OIG also educates pharmacists, providers, and compliance officers about pharmaceutical fraud trends, recreational use of potentiator medications, case examples, and how to use data metrics to improve compliance reviews.